For starters, pineapple is sweet enough—maraschino cherries are delicious, but kind of overkill. We’ve had some lovely, tart blueberries in VA this summer, so I swapped those in for flavor and color contrast, and then brightened the whole caramel up with fresh herbs and lime. 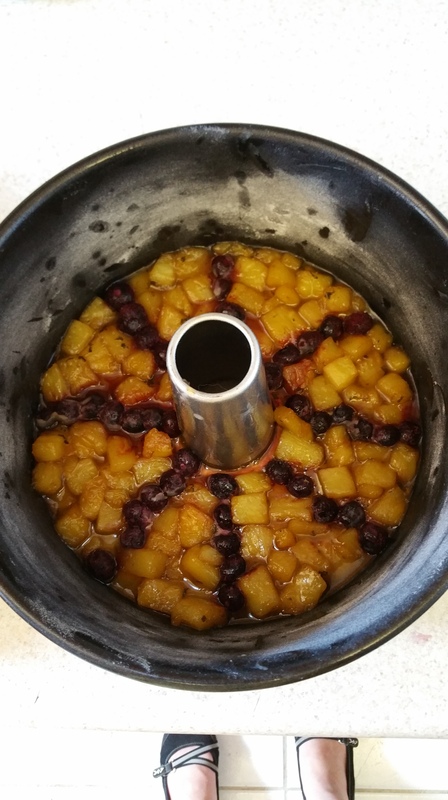 I also diced the fruit and let it cook with the caramel, rather than layering them individually. It really let the fruit soak up the herbs and zest. Yum! As for the cake itself, well, there’s nothing wrong at all with a good white cake, but my favorite batter is a good old-fashioned yellow butter cake. And frankly, no egg whites to whip means less bowls to clean. Shall we? Preheat an oven to 350 degrees. 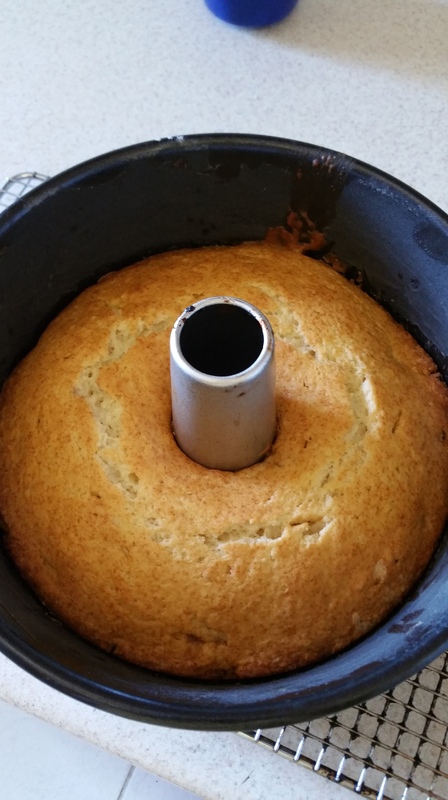 Butter a tube pan, bundt pan, or 9 in. cake pan thoroughly. 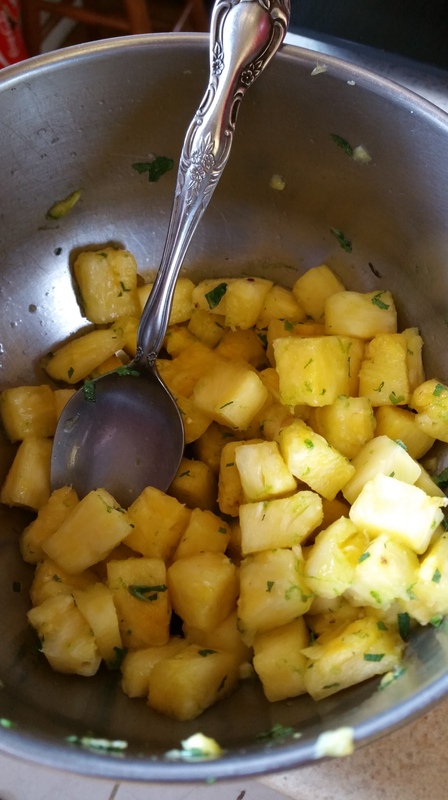 Combine the chopped pineapple with the lime zest and herbs and set aside. 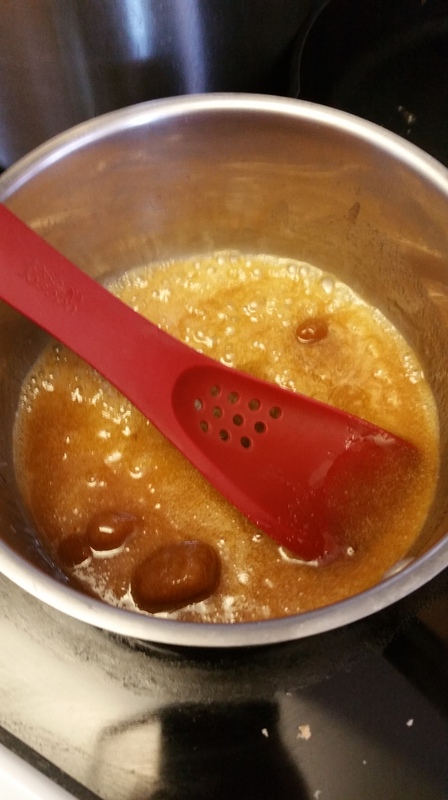 To make the caramel, combine the brown sugar, lime juice, and butter in a saucepan over medium heat. 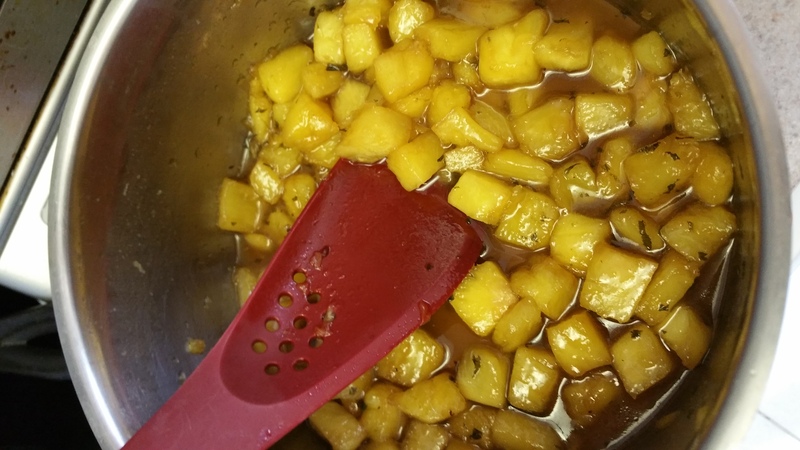 Once the sugar dissolves and the caramel is bubbling, add the pineapple mixture, and cook until fruit is soft, well-glazed, and the caramel has reduced by half (5-7 min). Set aside to cool slightly while the cake batter is prepared. 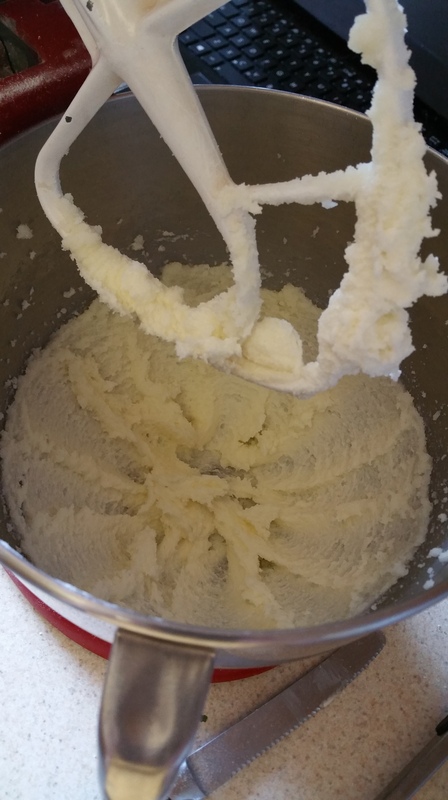 Cream the butter and sugar until light and fluffy, then add the egg and yolks one-by-one, mixing and scraping the sides of the bowl between additions. Add the vanilla and mix well. 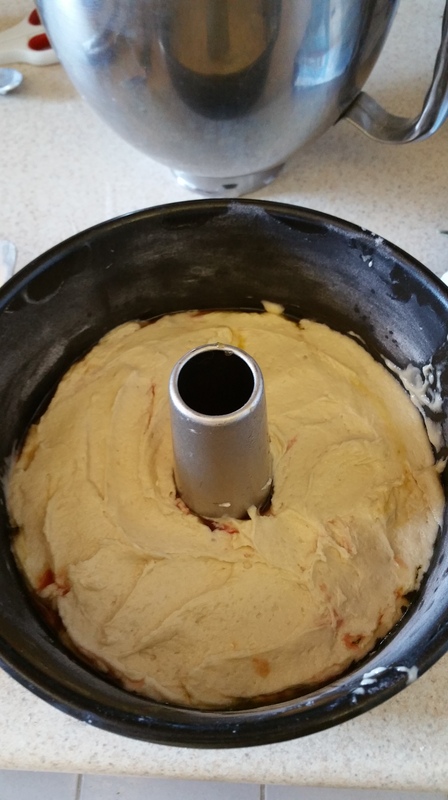 With the mixer on low speed, alternate adding yogurt and the flour mixture until all is incorporated. 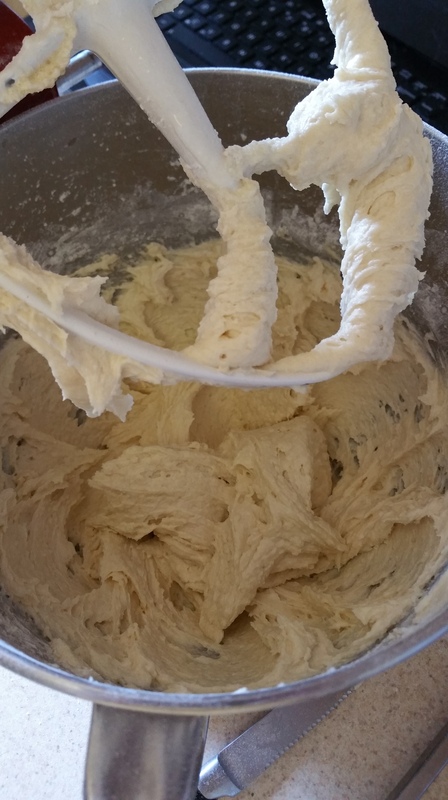 Mix just until the batter is even. 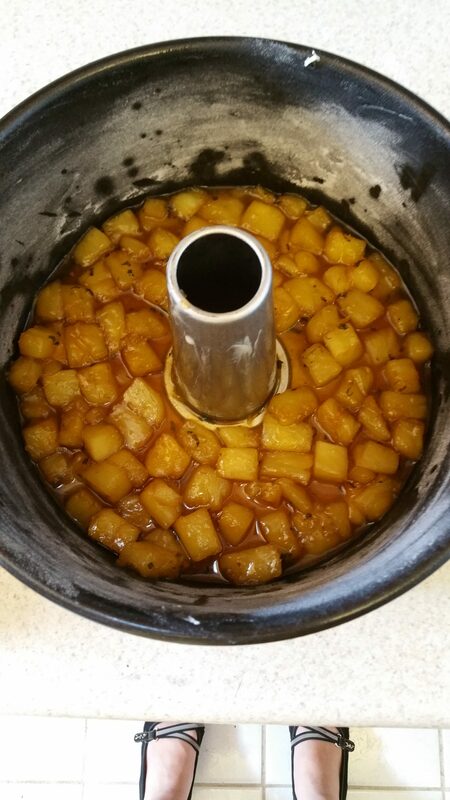 To assemble, pour the pineapple and caramel in an even layer on the bottom of the pan. Then, make decorative lines using the blueberries. Pour the cake batter over the top. It is a stiff batter, so use an offset spatula to smooth it as evenly as possible. Bake the cake for 40-50 minutes or until golden brown on top. 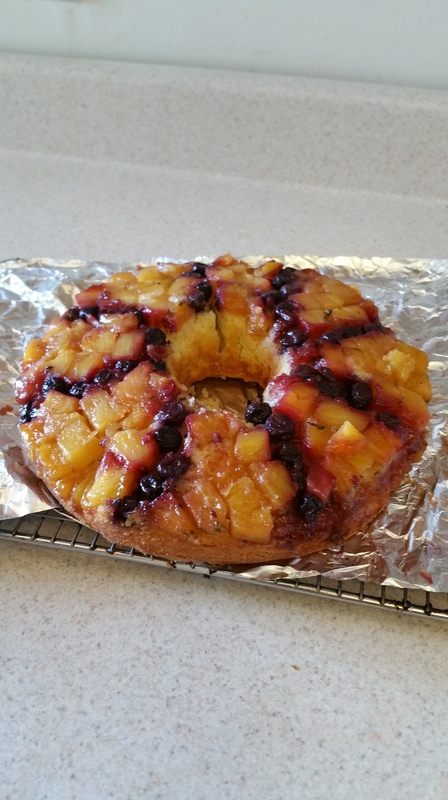 A knife into the cake (not the fruit layer) will come out clean. 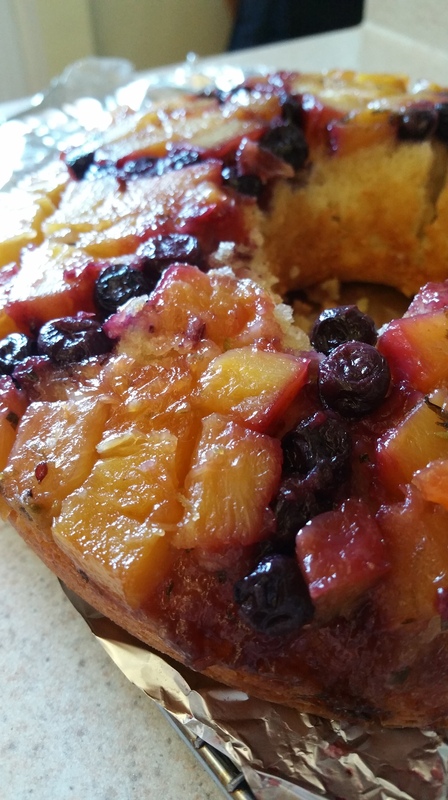 The cake is buttery and rich, the caramel and fruit are tart and sweet, and it all comes together so beautifully. Enjoy and be inspired to make your own upside down creations!